I’m sorry for the delay in posting. I have been focusing on finally getting the website up and running. 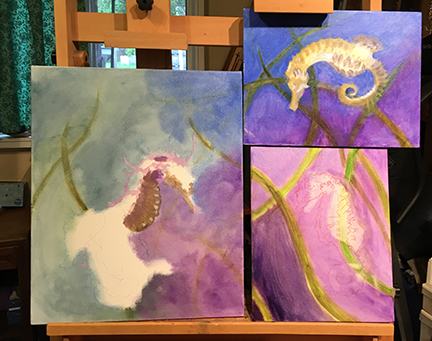 Currently, I am working on a triptych of seahorses. Two paintings I have done at the same time, but three is a new thing for me. This is only the first layer, and my goal is to have each of these paintings stand on their own or as a part of the set. I’m “deep in the uglies” as I like to call it, and I can see glimmers of where this will go when I’m done. The theory is, by working on all three paintings at the same time, I can keep the style the same throughout. If I completed one painting at a time, it is likely that my style or choice of painting methods would change, and end up not working as well together. I have been working on these at my weekly “paint at the farm” events on Tuesdays. Names for the paintings haven’t come to me yet. They will as the personality develops.